Please help this project by signing my petition. The idea is so great that it may help save the world, but to do so we must get the attention of our governments away from weapons and war and towards unity, coexistence and peace. This crossing, whether in the form of a bridge or tunnel, would be a modern day tearing down of the Berlin Wall and bring peace between the world's two superpowers, America and Russia. Now onto ideas for building it. One is an underwater tunnel (the longest tunnel in human history), and another is the longest bridge in human history. How to build the longest bridge or the longest tunnel in the most extreme climate on the world, next to Siberia and the Arctic. One idea that I had was to not build one continuous bridge but rather through dredging, build two more islands, one island between Russia and Big Diomede Island and another Island between Little Diomede Island and Alaska. Then only 5 relatively small bridges (or tunnels) would be required as opposed to one continuous one. Another idea is remove water and raise the ocean/sea water basin by adding rocks (which are abundant in Alaskan and Russian topography) and then building a not so deep tunnel. A third idea is to permanently connect the land using dredging, but that would separate the Arctic and Pacific and the natural water flow, so perhaps a final idea would be as many dredged islands as possible (perhaps 2 between Russia and the Diomedes and 2 between Alaska and the Diomedes) so that as little time, money, resources and manpower is spent on the connectors (a bridge or tunnel). I personally prefer both a bridge and tunnel because certainly this would be the most trafficked thoroughfare in the world, but any connector that has 6 lanes going and 6 lanes coming (12 lanes total) in two separate tunnels and a third tunnel for high speed rail is also acceptable. Anything that connects a, for far too long, separated world and its 8 billion inhabitants. At about $300 Million per warhead and a total of 15000 nuclear weapons stockpiled on this uncertain planet right now, that totals to $4.5 Trillion (likely more) to construct every single nuclear bomb since World War 2. A greater, longer lasting bond between America and the rest of the world can be forged if a simple road is constructed, the greatest road ever built by man, between Alaska and Russia. This road will connect 8 billion people and connect 6 continents. It will be a symbolic modern day tearing of the Berlin Wall, similar to President Reagan in his day, and would signify a final, permanent and everlasting sign of friendship between the United States and Russia. Instead of nuclear arms race, we must have a race to see who can build the 10th Wonder of the World, the Bering Crossing, first. Stretch the peninsulas out as much as possible, whether they are stretched underground (for a tunnel, to make it as short, timely, and cost efficient as possible) or whether they are stretched above ground (for a bridge, to make it as short, timely, and cost efficient as possible). Dredging is costly, and a singular bridge across this region would be much cheaper, but long term, extending the peninsulas or building 4 or 5 small islands (really, just landing pads for a bridge or tunnel) would make the construction and engineering of a bridge or tunnel MUCH easier and hassle free, especially in this cold regional climate. Cost to operate all planes per year? OR over $521 BILLION to run and operate every plane in use, every year. Carbon emissions of all planes in the world? Grams of fuel used by all planes yearly? Grams of carbon emitted by all planes yearly? OR over 2.87 BILLION or basically over 3 BILLION metric tonnes of carbon emissions emitted by all planes in the world every year. And there isn't a mere $20 Billion for a peace making, pollution finishing road between USA and Russia? Who is paying these obscene amounts to build polluting, gas guzzling planes (both commercial passenger planes and military planes)? Who pays the government and who pays the plane companies? Who spent over $4.5 TRILLION to build useless, pointless weapons that can kill every person on earth thousands of times over? How did those governments gather such obscene amounts of money to fund useless weapons? as a max projected cost. Maybe this figure might build a single end/start point. Have you seen the 55 billion dollar estimate for the North Long Island Bridge? This project would be nothing short of 100 billion and that is a conservative estimate in today's climate. And just a reminder, the cost of building the roads to the construction sites to even get the construction equipment and workers there. It looks like the nearest connection to the North American rail network would be in Hay River... which is about as far away from the Bering Straight as Yakutsk (the nearest connection to the Russian rail network). Right, but without some sort of reform in how the US builds infrastructure, do you expect our costs to be like the examples you gave? As a reminder, I'd love for the project to happen. Make no mistake. Yakutsk is not connected to mainland Russia until the bridge over the Lena river is built. Since the completion of the Crimean bridge, the Russians are planning to build this bridge (this is going to be a challenge since they will be building a big bridge in permafrost with very short building season, since you cannot build there in the winter). After Lena bridge is completed, they will probably start on the Sakhalin bridge construction, which would be another megaproject, as it will connect Sakhalin island to mainland Asia (Russian Far East). On the Russian side, there are long term plans to build a link all the way to Chukotka (the Russian side of the Bering straight crossing) regardless what happens on the US side, and independent of any Bering straight bridge/tunnel crossing. Hay River might be the farthest north, but there's a couple points that are nearly as far north but further west. Fort Nelson is one, and the Tacla subdivison is the other. The Tacla sub is uncompleted but was graded all the way up to Dease Lake-pretty much all you'd need to do is drop in some culverts and the rails. Still a very long distance to the Bering Straight though. Red and dark orange sections were completed, light orange and yellow sections were cleared and graded. The rest... is what I imagine a line from there might look like. Aren't we getting most of the workers from the Siberian gulags? I can't see labour costs being prohibitive in this venture. Materials sure, but the workers can walk there. The real problem is there is no value in connecting two unpopulated areas which are thousands of kilometers away from any useful center within any of the countries that might be involved. Who's going to use it? Shipping companies? Wouldn't a boat be more effective than slogging materials thousands of kilometers by road? Thanks I just spent a while following it on Google Earth. Were there plans to connect it to the Alaska Railway (which is probably another 1000 miles or so...)? Who's going to use it? Shipping companies? Wouldn't a boat be more effective than slogging materials thousands of kilometers by road? It will create peace as it would require two countries that were once allies (but became fierce rivals in a competition to create destructive killing machines), to come to terms and agreement. It would also create global peace, as almost every country in the world will be involved in this project, in its costs and in its construction, and every country will benefit from this project economically, socially, politically, environmentally. This road gives the world the greatest chance at a near zero percent poverty rate, globally. (although there will always be factories, industry and pollution in an industrialized world) This road gives the world the greatest chance at a near zero percent pollution percentage, globally (by eliminating the cause of 50% of all pollution - fuel powered planes (and cars, which will all be electric within 10 years)). This road (bridge or tunnel) will take less than 10 years to build and as little as 5 years if a larger workforce is hired. China is the largest exporter of goods on earth. Currently it takes a cargo ship 30+ days to haul exported goods from China to America via the Pacific Ocean. This project would help world trade tremendously. It would only take 21 hours for a high speed train to haul exported goods from America to China, if this road is constructed. According to the World Bank, more than 500 million people were lifted out of extreme poverty in China. If China was simply able to do this by selling and trading goods with the Western World through sea (which takes months) and air (1-3 days), and put its people to work making products for the rest of the world, then how many people in 195 countries can be lifted out of poverty if the selling/trading time is decreased to 20 hours via high speed rail. 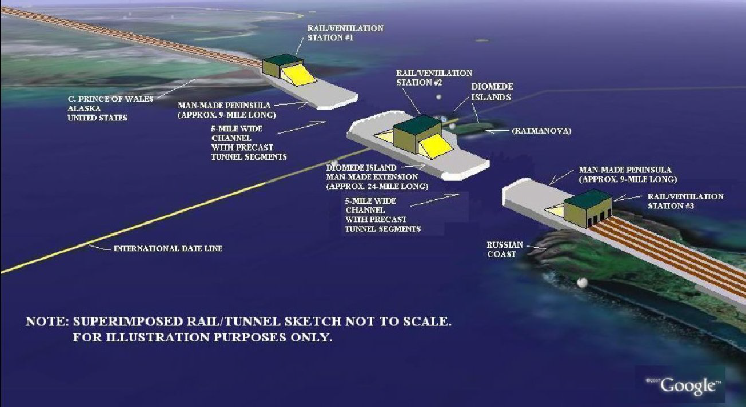 Oil tankers transporting oil via the Pacific also take months, while a pipe line will also be constructed in a separate tunnel in this project, allowing endless oil for the entire world and eliminating the need for cargo ships. This road lifts the entire world up at once, lifts the economies of all the worlds countries at once, and unites the entire world. This isn't just a road connecting two countries, this is a World Road, a new Silk Road for the 21st Century. 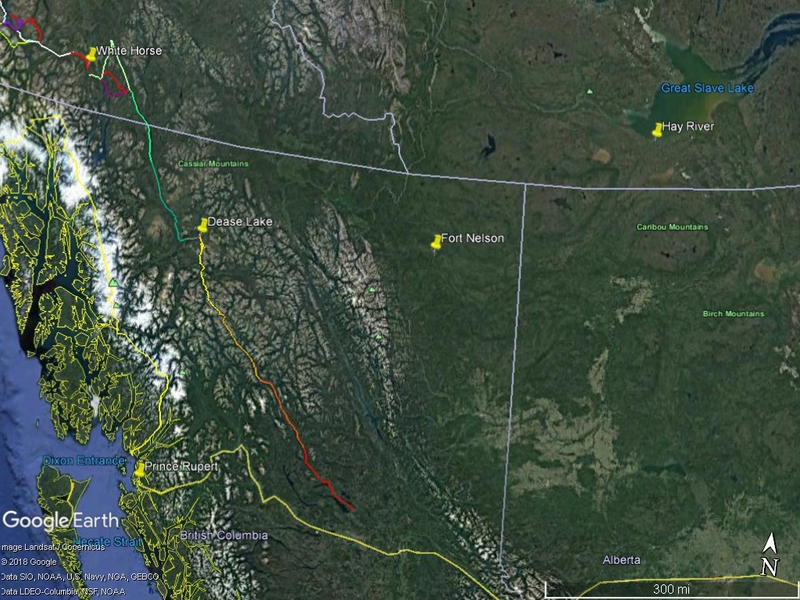 The Alaska railway has an extension in the works from North Pole to Delta Junction, a whopping total of ... 80 miles. 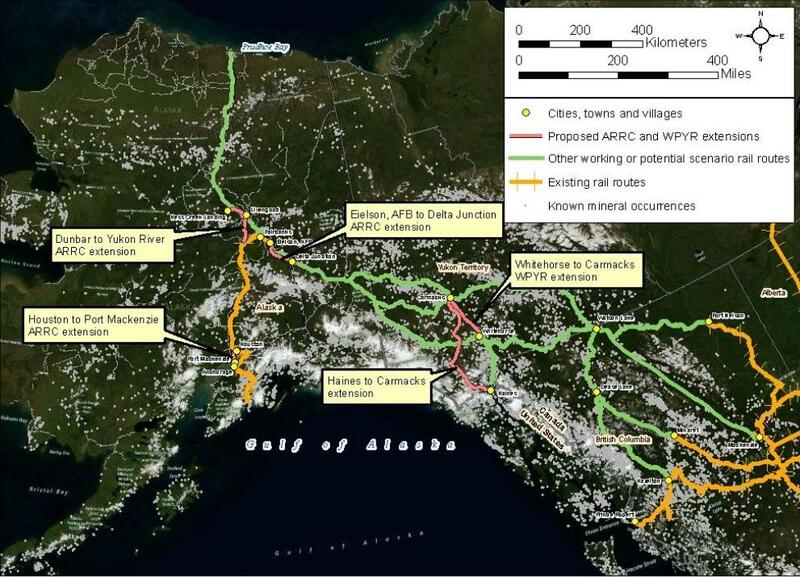 A study was done on potential routes between the contiguous rail network, Whitehorse, and the Alaska Rairoad. The Interbering website is very interesting. Shipping containers by sea is way, way, way, way cheaper than shipping by rail. Cost to fly every single plane in the world every year (cost of fuel for all planes per year): $521 BILLION to run and operate every plane in use, every year.